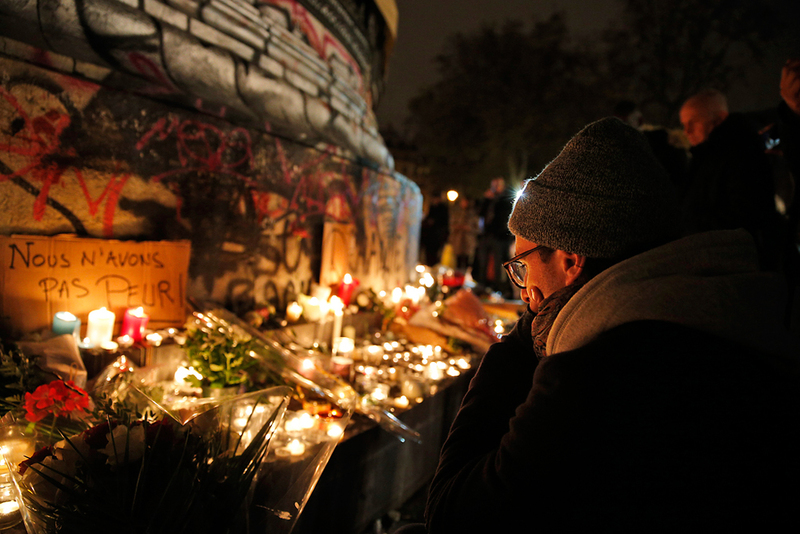 A person wears a French flag at a memorial outside the French Embassy, Saturday, Nov. 14, 2015, in Ottawa, Ontario, following deadly attacks in Paris on Friday. A man pays respect to the victims of the attacks next to a sign reading "We Are Not Afraid" at Place de la Republique (Republic Square) in Paris, Saturday, Nov. 14, 2015. French President Francois Hollande vowed to attack the Islamic State group without mercy as the jihadist group claimed responsibility Saturday for orchestrating the deadliest attacks on France since World War II. A woman lays flowers in front of the French consulate in St.Petersburg, Russia, Saturday, Nov. 14, 2015, for the victims of the Paris attacks on Friday. French President Francois Hollande said more than 120 people died Friday night in shootings at Paris cafes, suicide bombings near France's national stadium and a hostage-taking slaughter inside a concert hall. A man holds his head in his hands as he lays flowers in front of the Carillon cafe, in Paris, Saturday, Nov.14, 2015. French President Francois Hollande vowed to attack Islamic State without mercy as the jihadist group admitted responsibility Saturday for orchestrating the deadliest attacks inflicted on France since World War II. A woman is comforted by others outside the Carillon cafe and the Petit Cambodge restaurant in Paris, Saturday Nov. 14, 2015, a day after over 120 people were killed in a series of attacks in Paris. No queues, closed ticket offices and souvenirs shops are seen at the Eiffel Tower in Paris, France, Saturday, Nov. 14, 2015. French President Francois Hollande vowed to attack the Islamic State group without mercy as the jihadist group claimed responsibility Saturday for orchestrating the deadliest attacks on France since World War II.